Yesterday at the horse barn I was looking out on the green field and a small red spot caught my eye. It was one of those lucky days that I happened to have my camera in the car, so I stopped and quietly got out to get a distant capture. It was a member of the Red Fox family where I know where they live. Some of you may remember my attempts to create a blind where I can sit and wait for the perfect Fox Kodak moment. Since that day I’ve been putting dog food out for them nearly every day. Helping them to grow big and strong, and to develop a routine of coming to the same spot for dinner. I had fresh food in the car, so I rushed to the blind spot and set up as quickly as I could. It wasn’t long before the fox came down the trail. But she stopped in her tracks when she saw the big lens sticking out of the blind. Her keen sense of smell knew that a human was there, even if I had lots of horse smells thrown in. She sat and sniffed the air, peeking through the brush towards me. 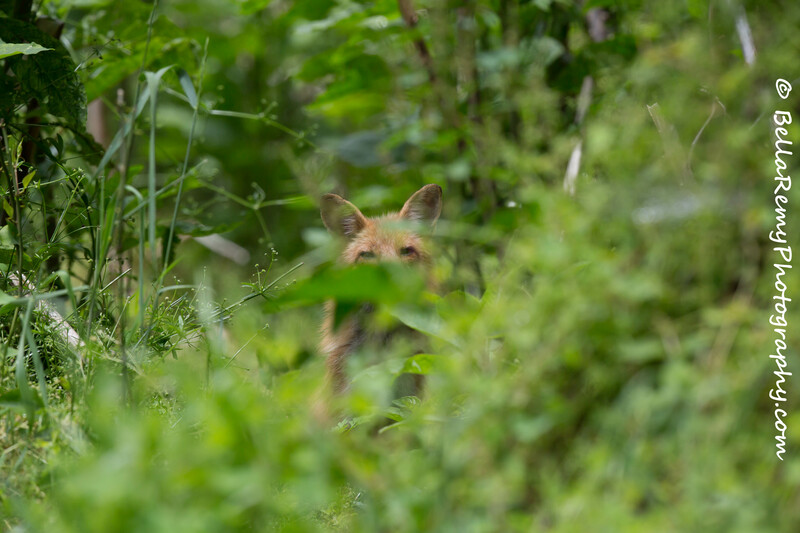 It was hard to focus on the fox with all the surrounding greenery, so I had to go to manual focus and do my best guess. I’m thinking that this is Mama Fox as I could hear some squeaks coming from their burrow. She barked a few times in alarm before leaping back into the woods. And so the wait began again. She returned shortly after, and before I could get her into the viewfinder she rushed off again. Sigh…wait some more. After 45 minutes one of the pups started coming down the trail. I moved quietly to position myself at the view finder. Camouflage hat, camouflage long sleeve shirt, hiding behind the blind. Focus is tough….click click and off he ran. I put new food out today and will keep trying. 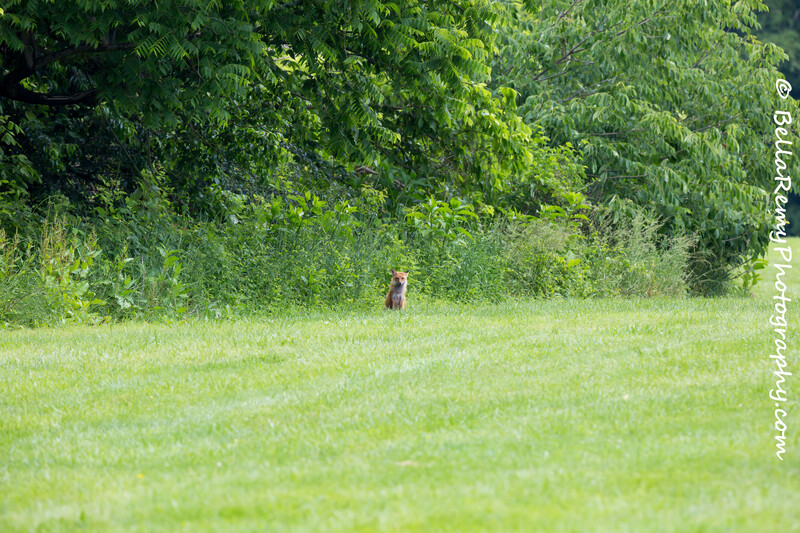 I’m determined to get my gallery shot of this beautiful fox family. While my simple blind works, it keeps moving in the wind and I had to duck down several times to keep hidden. I’m trying a couple of other blinds and will share you my experience with them with the second one arrives. I really need to spend a lot more time stalking. More like a full day. A couple of hours is all I can take though. Thank you very much Clare. So happy you like that image and appreciate your comment. 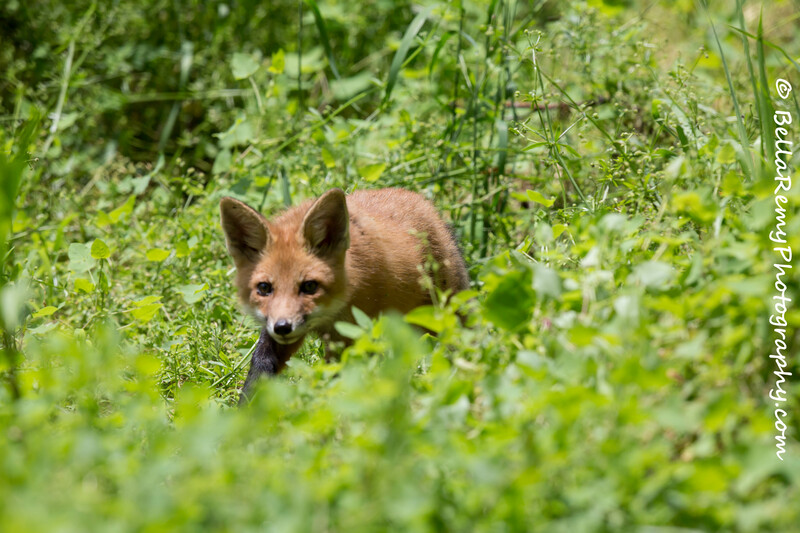 Any photo of a fox is a good one! You are too funny. You may find this interesting. Since I set up that blind and left it there. Although it keeps falling down, the two short visits I’ve made have caused the foxes to change their trail route. Talk about sensitive little critters. Thank you!! Now only if I’d keep up with my comments, so sorry for such a delay in responding to you. The horses really taught me how to be patient. Well, you caught one for now. Patience takes forever. Maybe you have to rub some more “animal” smell on you, Emily. Don’t think the thought hasn’t crossed my mind Perpetua. Would you believe they sell fox pee to help masquerade your scent. Ha ha ha ha… will you use the “perfume”? Thanks Fatima !! Off to France again this summer?